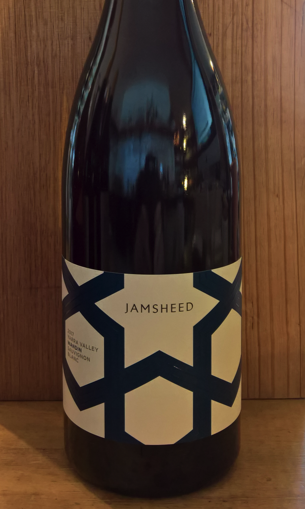 2017 Jamsheed 'Wandin' Sauvignon Blanc. Yarra Valley-VIC. An excellent example of how good Sauvignon Blanc can be in the right hands. A little skin contact here allows an emphasis on savoury herbs. There's still a pleasant pineapple-like acidity but much more elegant than most other examples. "From a vineyard formally known as Bluestone Acres in the Upper Yarra area of Wandin East, nearby Seville. We took over the lease and farming of this vineyard in September 2016. This is a north facing site, planted in the mid 90's on red Monbulk clay, volcanic red clay over bluestone rock (exact same as the cobblestones in Melbourne City). Since taking it over we have farmed 'biologically' (basically uncertified organic), using no synthetic herbicides, pesticides or fungicides and trying our best to re-vitalise the microbiology of the soil, along with the fact that the vineyard has been unirrigated since we took it over.